The Cosmic Doctrine is perhaps Dion Fortune’s most overlooked and undervalued work. Next to The Mystical Qabalah, it is also possibly her most important. The text presents a near complete cosmogony stuffed full with enough images and concepts to keep the adventurous seeker busy for a lifetime. As a comprehensive philosophical and magical system, it presents a detailed interpretation of the origin of life, the Universe, Deity and Humankind. Like any cosmogony, it has some imperfections, interspersed with occasional annoyances and contradictions. This article is offered in the hope that it will whet readers’ proverbial whistles to further explore the depths of The Cosmic Doctrine. Before we go any further, it’s important for me to set out a key foundational premise – the honoured place of cosmogony in the occultist's toolbox. In any longer term esoteric endeavour, a basic knowledge of cosmogony is vital. Without a functional cosmogony as a cornerstone for the Work a superstitious disposition can be exacerbated due to the lack of a model to relate effects to their prime causes. Possessing an effective cosmogony enables the occultist to see the Western Mystery Tradition for essentially what it is – a means to an end, that end being the betterment of the individual, their community, nation and planet. Many students who approach The Cosmic Doctrine dive for safe cover at the earliest convenience, settling for an arguably easier cosmogony such as that offered by the Qabalah or Astrology. This is understandable for it is not a book that you can read or understand in the normal sense. It is more like a mysterious treasure trove waiting to be mined over a lifetime for precious metals and rare gems. If you do try reading it like a Tony Parsons novel, you will probably suffer chronic indigestion and most likely never come back for a second helping. No-one has ever been able to extract the benefits of a deep mineral mine from the comfort of an armchair. Instead, The Cosmic Doctrine is a work to be approached with all of one’s efforts, intuition and imagination. It will only be through drawing diagrams of its concepts, contemplating, meditating and relaxed pondering that the text will open the inner doors of understanding. A generous smattering of perseverance helps too. The material was originally communicated from the Inner Planes between July 1923 and January 1924, while Dion Fortune was based in Chalice Orchard at the foot of Glastonbury Tor. 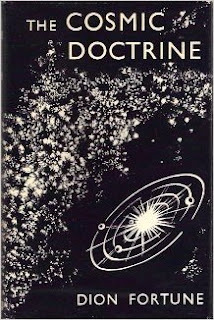 However, due to Alan Richardson’s sterling researches, we also know that some of the basic elements of the text display at least a surface façade of similarities with some of Theodore Moriarty’s Aphorisms of Creation and Cosmic Principles. There could be a number of reasons for this and plagiarism isn’t one of them. My personal view is that Dion Fortune had spent a great deal of time learning from Moriarty and was essentially working on the same contacts as he and his group. The Inner Plane Adepti tend to utilise the existing symbol system in the receiving medium’s mind – well stocked or otherwise! In The Story of Dion Fortune, Charles Fielding tells us that the communications were accompanied by a mêlée of notable physical phenomenon, due to the need to use elemental forces as a backup to provide a stronger communication channel. On at least one occasion, the altar light’s flame “rose about five or six feet in height where normally the light only came up about an inch.” During one of the sessions the scribe, “almost fainted as there was also a great rush of wind when the flame increased.” Anyone who has been around the Tor, particularly at the liminal portals of dawn and dusk, when it is quiet and empty of New Age Travellers and sightseers, will appreciate the dynamism of the full spectrum of elemental activity in the area. Casual readers would do well to heed this, particularly the section I have italicised, which is often misquoted, resulting in a subtle but importantly different meaning. The language within the text can be exceptionally difficult at times and some of the terminology can be easily misinterpreted if taken out of context or at face value. Now, practicality coupled with responsibility can be a tough old thing for the best of us. Many students appear to pursue the Western Mysteries for the opposite reason, for some respite from the burdens of life’s responsibilities and practicalities. They often do this quite unconsciously. Being unable to cope with mundane challenges and not finding it easy to get on with others, they seek an escape route. Indeed the avenues of escape from modern life are legion, from smart phones, computer games and social networking to complete submersion in the enticing opiates of the global entertainment industry. However, occultism is no way to escape from the responsibilities of life. Even a short period invested in thoughtfully mulling over the images and concepts presented in The Cosmic Doctrine should encourage the seeker into a further immersion into the depths of the Game of Life with its attendant joys, pains, challenges and rewards. That can only happen if we get up and go to work, leaving the comfort of the coal fire and armchair behind, along with endless attendant theorising. While theory may well provide many happy hours in the armchair with accompanying warm and sweet feelings of excitement, practice, work and play will bring a far richer life journey. Within the deep mine shafts of The Cosmic Doctrine there is much practical advice to be found. While some of the material can take years to percolate, much of it is immediately practicable. Perhaps the most rapidly accessible advice found within the communication is that relating to the text’s Seven Laws. Some of the implications of these interdependent laws are so far-reaching that one can rapidly leave considerations of practical application behind if not careful. Other aspects have far more immediate application in mundane life. Ultimately the full value of these Seven Laws will be better appreciated once a wider understanding of the concepts from The Cosmic Doctrine is gained alongside further practical work. A brief analysis and commentary on the Seven Laws is offered below. It assumes a basic appreciation of the esoteric concept of the Seven Planes. For those readers who do not already have an understanding of this, in order to more fully understand what follows, I would encourage you to check out Dion Fortune’s own comments throughout her published works on the Planes prior to reading the next blog.